Explorer.exe is an executable file for Windows Explorer. The product needs to modify Windows Explorer to add the ability to explore and mount Acronis Backup & Recovery 10 archives (*.TIB). Click Continue to finish the installation. The explorer.exe process will be automatically restarted after the installation completes. (!) 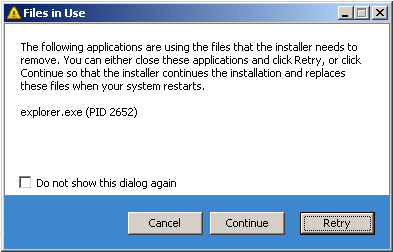 Unattended installation completes successfully without the warning and without a reboot. You can also log off and then log back on before the installation to avoid the prompt.